A versatile chimney cap can be the best long-term investment you can make for a chimney. 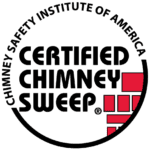 We recommend that every chimney flue is covered with some type of chimney cap, as it can be very beneficial to your chimney’s damper system. The caps keep debris and pests out of your chimney. These pests often carry diseases and a cap can be the gate that keeps these animals from entering your home. A damper cap is a cap that has mounted dampers built in, usually made from stainless steel lids that close airtight against a rubber seal. It can be operated from in the home simply by pulling down on a chain. A top mounted damper is an excellent solution if your traditional throat damper is damaged or needing to be replaced.